The Cultural & Community Services Department offers seasonal athletics year-round, for adults of all ages. Each program runs for a set period of time and meets at a regularly scheduled time. Registration for all activities is held at the Pelican Community Park Community Center, located at 18115 North Bay Road. 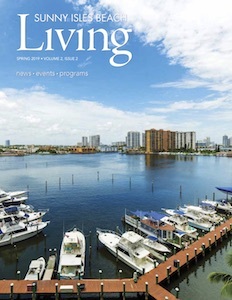 *To view all athletics offered for the current season, including dates and prices, please download the latest edition of Sunny Isles Beach Living Magazine. Teams play a competitive league schedule. Fee is per player. Get active with us and join our strength and resistance group. This class incorporates light weights, balance techniques and resistance training to improve overall well-being. Participants will be removed from the program if they miss 2 consecutive weeks. Come try this ancient form of exercise that can help maintain strength, flexibility and balance. All skill levels are welcome. Participants will be removed from the program if they miss 2 consecutive weeks. Enjoy the company of others as you walk your way to better health. Our walking club meets two days each week. Learn about healthy dieting, nutrition and exercise. All ages welcome. This gentle form of yoga is practiced by sitting on or standing using a chair for support. This slow-paced, off-the-floor program is great for balance and confidence. Participants who miss two consecutive classes will be removed from the class roster. Meditate under the light of the full moon, listening to the ocean waves and the peaceful sounds of the beach. Participants must bring their own yoga mat. Parking passes available, but you must register in advance, for this FREE Class. Offered once a quarter during the Full Moon. Re-invigorate your mind, body, and yoga practice! The City offers various types of yoga classes, including Hatha, Vinyasa & Power Yoga. Participants bring their own mat. Sessions may vary by season. Start your morning off mindful of the beautiful sunrise over the ocean. This relaxed morning yoga class takes place each Wednesday on the Beach in front of Samson Oceanfront Park, from 7:00 am – 8:15 am. Participants must bring their own yoga mat. This class is FREE but advanced registration is required. For more information, call 305.792.1706. Experience the latest craze in the expanding world of unique and fun sports! Learn to ballroom dance with a knowledgeable instructor. Prove you’ve still got it as we kick off our inaugural Adult Flag Football season. “Latin Fusion” Dance involves structured movement, warm-ups and group interaction. This class will combine elements of various styles of Latin dance (i.e., salsa, merengue, bachata, flamenco, etc.) in a low impact yet energetic dance/exercise workout. All levels welcomed. Master Sang offers instruction in Taekwondo. All skill levels are welcome. Try this new sport! Pickleball is like playing tennis, but on a smaller court with larger paddles! Doubles play on indoor courts. The City sponsors co-ed competitive soccer league play for ages 17 and older. Games are played at Senator Gwen Margolis Field, 17815 North Bay Road. Games are officiated by certified referees and include a regular season and post season tournament.